I’ve making patchwork pillows in shades of blue this week. The mosaic arrangement on this courtyard wall would be a good one to copy in fabric. “Vnutri dvora Tilli︠a︡-Kari. Detalʹ na pravoĭ storoni︠e︡. 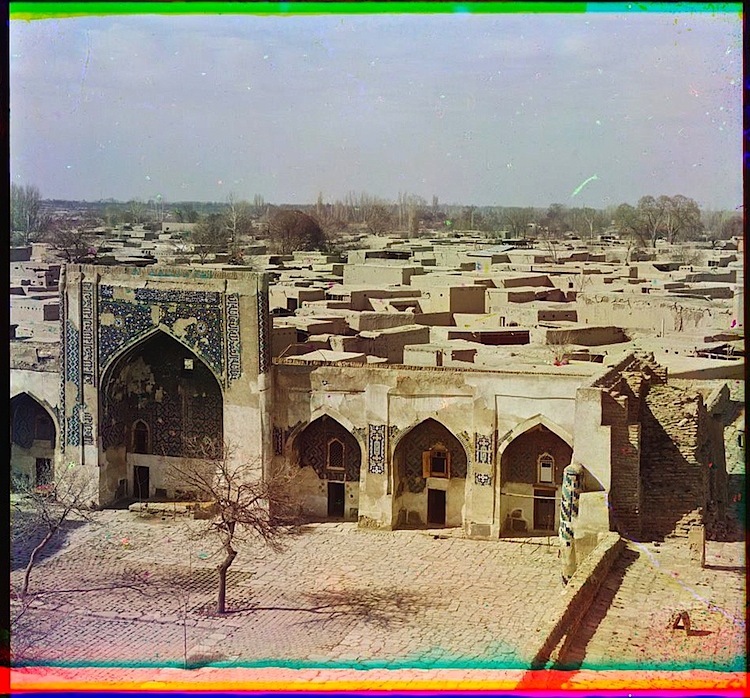 Samarkand (Inside Tillia-Kari courtyard. Detail on right side. ), between 1905 and 1915, by Sergeĭ Mikhaĭlovich Prokudin-Gorskiĭ, via Library of Congress Prints and Photographs Division (also the photo below). In the center of Samarkand is the Registan complex, consisting of three madrasah (religious schools). The third of these, the Tillia Kari Madrasah, was built in 1646–60 on the site of a former caravansarai. Its basic plan is formed by a rectangular courtyard, bounded by arcades that contain rooms for scholars. Although much damaged, the facades show profuse ceramic decoration in geometric and botanical motifs, as well as panels with Perso-Arabic inscriptions above the door of each cell. 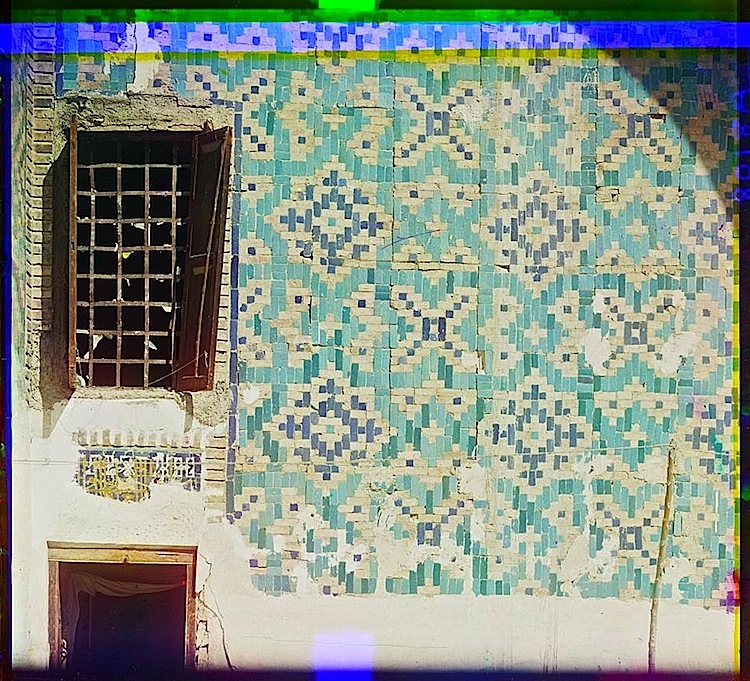 Seen here is a detail of a cell facade inside the courtyard, with the walls covered in a geometric pattern of small glazed tiles and a fragment of an inscription panel above the door. — from the image’s page on World Digital Library, a project of the Library of Congress. Sergeĭ Prokudin-Gorskii made early color photographic surveys of the Russian Empire in the decade before World War I and the Russian revolution. He left Russia in 1918, eventually settling in Paris. The Library of Congress purchased his collection of 2,607 images from his sons in 1948. There are more vintage photos of Tillia Kari here. Not Delft or delphinium, not Wedgewood. . . Many a quilter has been inspired by tile work like that! Back to the fabric store. . .